Automobile industry in California State. Off-Road Parts stores in San Diego, California. Off road warehouse list, off-road brands, 4×4 off road accessories shops online and in-store address, phone number and more. 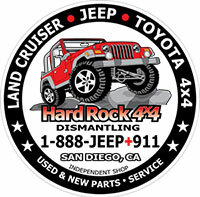 Largest inventory of new and used Jeep parts and Land Cruiser used parts in San Diego County. Also do repair and fabrication works. Saturday: 8:00am till 2:00pm. Sunday: CLOSED. Auto supply store chain specializing in Off Road Truck & Jeep 4X4 Parts & Custom Installation in California. Best priced parts for trucks, Jeeps, SUVs & ATVs at 4WP stores in California. ** $10 Off Orders of $150 or More with Discount Code. ** Find deals up to 20% OFF on off-road accessories from your favorite 4×4 brands. ** $20 off Orders Over $400 with code BUYNOW at 4WheelParts.com , For a Limited Time. Exclusions Apply. One-stop off-road store in San Diego since 1973. Located in Southern California with four retail stores in San Diego, El Cajon, Escondido, and Temecula. Also offers repair and maintenance service on most domestic and foreign cars, trucks, and SUVs. Racing car parts store in San Diego, California. Offer products from the following brands : King Shock Technology, FOX, Bilstein, Radflo, Baja Designs, Camburg Off Road Engineering, Carli Suspension, Hypercoil, ICON Vehicle Dynamics, Old Man Emu (OME), RCD Suspension, Rigid Industries, Total Chaos Fabrication. San Diego, CA 92120, United States. An authorized Polaris dealership. Products are Polaris RZR’s, Rangers, ATV’s parts, accessories and custom parts. In business since 1977 building custom cars and trucks. Full fabrication shop with an off road product line for shops and home builders. Selling online and in-store quality fiberglass body parts, motor mounts, suspension kits and components for the off road chassis etc. Auto parts store in Chula Vista, California. Providing quality racing equipments for more than 25 years. Also a leading supplier of race car or pre-runner with top quality parts and accessories at competitive price. Products : Accessories, Body Components, Brakes & Pedals, Chassis Components, Cooling, Drivetrain, Electrical Components, Engine Performance, Fluids, Fresh Air Helmet Systems, Fuel Delivery, Lights, Navigation/GPS, Safety Products, Seats, Shifters, Shocks, Steering, Suspension, Tires, Wheels, Tools, UTV Parts, Videos & Books. Car dealer (a franchised dealer of Chrysler, Dodge, Jeep and Ram vehicles), service center and auto parts (genuine Mopar parts) dealer in San Diego, California.